'NATURE CONNECTS: LEGO® Brick Sculpture' opens this Saturday, November 14 with 28 giant flora and fauna sculptures by artist Sean Kenney, created from nearly 500,000 LEGO bricks. 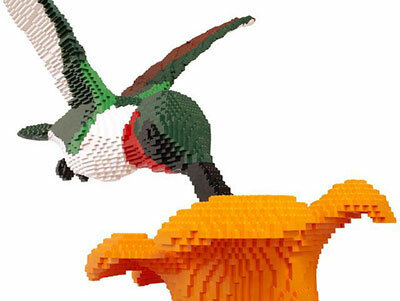 The Exhibit includes an 8-foot-tall hummingbird, 7-foot-tall rose, and life-size bicycle (made from 37,000 LEGO pieces). About 100 local LEGO sculpture contest entries will be on display too; vote for your favorites! 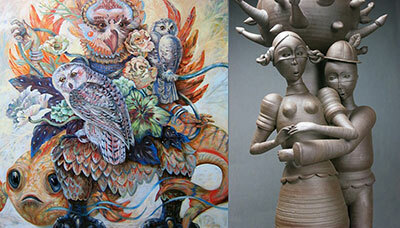 Kenney's sculptures spark creativity and encourage a greater sense of play in viewers of all ages. NATURE CONNECTS runs through February 7, 2016. Go to www.northwestmuseum.org for details. The Art Spirit Gallery at 415 Sherman in downtown Coeur d'Alene presents a show of new work by artists Kay O'Rourke and Gerit Grimm. The opening reception and ArtWalk is this Friday, November 13 from 5-8. Go to theartspiritgallery.com for more information and to see the show online. Arthur Fiedler and the Boston Pops became household names during the long running PBS series 'Evening at Pops.' The Spokane Symphony, under the direction of Assistant Conductor Jorge Luis Uzcategui, will recreate the tradition this Saturday, November 14, 8 pm at Martin Woldson Theater at The Fox. An 'Evening at Pops' repertoire consisted of a combination of light classical selections blended with hits from musical theater and other popular numbers. Musical selections for this concert include works from Bach, Vivaldi, Copland, Saint-Saens, Sousa, Scott Joplin and John WIlliams. Dinner provided by Beacon Hill Catering is available for purchase and is served from 6:30 to 7:15pm. Tickets are available at the Box Office, by calling 509-624-1200, and also at www.ticketswest.com or 800-325-SEAT. Former Free and Bad Company singer Paul Rodgers takes the stage at Northern Quest this Sunday, November 15 at 7:30pm. Go to northernquest.com for tickets and information. This Saturday, November 14, join All Things Irish and Christmas at the Lake in downtown Coeur d'Alene for their annual Open House. There will be product giveaways at both stores, plus food & wine tastings and lots of fun. Open house runs 11am to 4pm at both locations, 519 E Sherman Ave and 315 E Sherman Ave. For more information, call 208-667-2885 or 208-667-0131. This weekend, enjoy some Voodoo Rock with Mojo Box at The MAX inside the Mirabeau Park Hotel in Spokane Valley. This Friday & Saturday nights, November 13 & 14, starting at 9pm and running until 1am. Lots of dining, drinking, dancing and fun with Mojo Box! The Kalispel Tribe of Indians invites everyone to Northern Quest Resort & Casino's 15 Years of Fun celebration from 10 am to 5 pm this Saturday, November 14. Bring your friends, share the fun and be sure to enter to win one of 15 Northern Quest experience prize packages. The all-day event will feature free Slots, Blackjack and Poker Tournaments as well as free food samplings from all Northern Quest dining venues. Legendary singer Johnny Mathis will perform some of his greatest hits and personal favorites at the INB Performing Arts Center on Sunday, April 24, 2016. Best known for his supremely popular hits like 'Chances Are,' 'It's Not For Me To Say,' and 'Misty', Mathis has recorded more than 80 albums, 6 Christmas albums, and has sold millions of records worldwide. During his extensive career he has had 3 songs inducted into the Grammy Hall of Fame, achieved 50 Hits on Billboard's Adult Contemporary Chart, and ranks as the all-time #6 album artist in the history of Billboard's pop album charts. He has received 5 Grammy Nominations, and in 2003 he was given the Lifetime Achievement Award from the Academy of Recording Arts and Sciences. Don't miss Johnny Mathis live at the INB Performing Arts Center on Sunday, April 24, 2016! The Fireside Music Series continues at Arbor Crest with the music of Ron Green, tomorrow,Thursday, November 12, and on Friday, November 13, Just Plain Darin performs. Music runs from 5:30-7:30, and the tasting room is open from 5-8pm. Enjoy great music in a nice, cozy setting with the excellent wines of Arbor Crest. For more information, visit arborcrest.com. Tonight, November 11 at 7:05pm, the Spokane Chiefs play the Everett Silvertips at the Spokane Arena. Tickets available at spokanearena.com and at www.ticketswest.com or 800-325-SEAT. This Saturday, November 14 at 7:30pm, Hal Holbrook performs a one-man show as the legendary Mark Twain. Holbrook has been performing as Twain for 50 years. Tickets available at www.ticketswest.com or 800-325-SEAT. 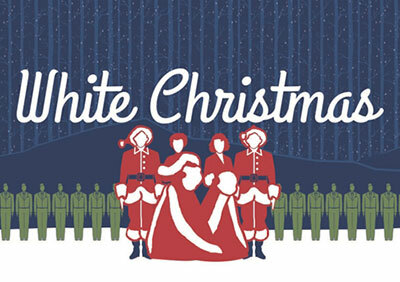 Enjoy a beloved holiday tradition November 20 through December 19 as Spokane Civic Theatre presents 'White Christmas.' Based on the timeless film, this heartwarming musical adaptation tells the story of veterans Bob Wallace and Phil Davis who have a successful song-and-dance act after World War II. With romance in mind, the two follow a duo of beautiful singing sisters en route to their Christmas show at a Vermont lodge, which just happens to be owned by Bob and Phil's former army commander. Curtain Times are Thursday through Saturday at 7:30pm; Sunday at 2pm. Discount tickets available with food donation for performances on November 27 or 28. Go to www.spokanecivictheatre.com for tickets and information.